A handful of maple trees native to China are potential landscaping species for North American yards, certainly worth exploring because of their features. These are small- to medium-sized trees, making them candidates for a variety of functions. Choose those that survive in your particular U.S. Department of Agriculture plant hardiness zone; most of these Chinese maples display some degree of cold hardiness. The Amur maple is small, with most developing to between 15 and 20 feet tall. 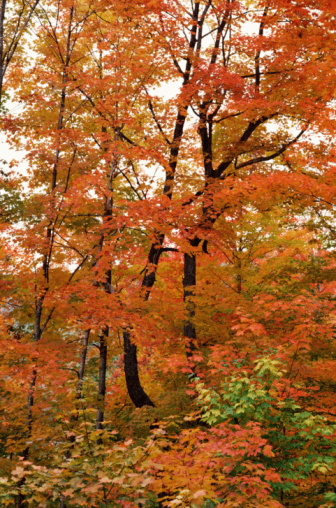 The snakebark maple, also known as David maple, grows from 30 to 50 feet high, while the paperbark maple is smaller, at 20 to 30 feet in stature. Shantung maple is another manageable landscaping option at 20 to 25 feet in height. The painted maple matures to between 30 and 40 feet. None of these Chinese maples is as tolerant of a severe winter as the Amur maple. It survives even in USDA zone 2, excelling where the climate is cold, featuring a cool summer. Chinese maples such as shantung maple and paperbark maple tolerate the cold of zone 4, growing into zone 8. Snakebark and painted maple are more sensitive to the cold, with zone 5 the coldest zone they survive in. The bark of snakebark maple is an asset, since it is green and purple-red with white stripes. The dark green leaves turn shades of yellow and purple in fall. The foliage changes to red on an Amur maple come autumn. Paperbark maple features a peeling bark of cinnamon and red shades, with red fall leaves. Painted maple leaves undergo a change from bronze in spring to green in summer, ending up orange and yellow in autumn. Shantung maple leaves start off as shades of purple, progress to green and by fall they are red, orange, yellow and purple. Use the shantung maple as a shade tree in small yards or as a specimen tree. Create groves of Amur maple, or use it on your patio. It works as a container tree and it serves to form hedges and screens. Painted maple is a possibility to accent an area of your yard. Highlight a section of your property with the paperbark maple. Its small size makes it appropriate as an understory tree or as part of a woodland garden. Snakebark maple stands out as a specimen, especially in a small yard with limited space. Can a Japanese Maple Be Kept Inside? How Fast Does a Japanese Maple Grow? When Do Maple Trees Bloom?